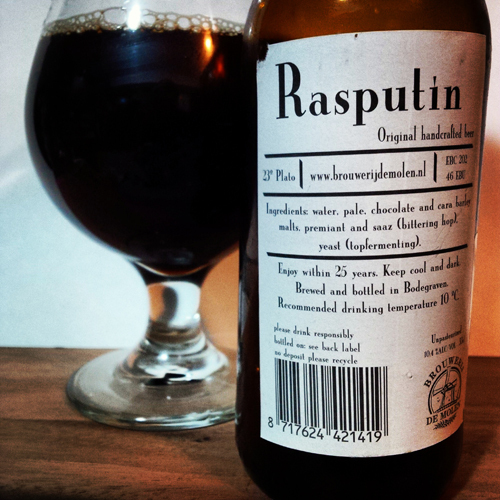 Brouwerij de Molen Rasputin: Bottled in March 2012 in the Netherlands, this Imperial Stout is brewed to a strength of 10.4% abv with 46 IBUs in a bottle that boasts the words “Enjoy within 25 years”. This is a beer is an interesting candidate for very long term aging should you have the patience and remaining lifespan to do so. I hadn’t cracked open a well aged beer for a little while, so I happily poured this into my glass and waited a good 30 minutes for it to warm and open up a bit before drinking. Aroma and Appearance: It pours a dark brown colour with no foam and no bubbles as expected with this style of beer. The aroma consists of malt balls, black licorice, roasted grains, toffee, currants and plums. Flavour: Super similar to the aroma, initially it features malt balls, plums and currants upfront with a super thick bodied middle that showcases burnt molasses and tobacco flavours. This cellared beer finishes with lots of rich chocolate, some leather, caramel, raisins and finally almonds. Overall Impression: Quite mellow from the aging and balanced with lots of flavour, this particular Imperial Stout drinks a little bit more like an old style ale than the jet black stouts I am used to. Rating: I give it a 8.5/10, pretty excellent beer overall with a good balance to it and lots of flavours. Food Pairing: Blue Stilton or another rich cheese on some grainy slices of bread would be a great pairing here that would enrich the cheese and bring out some new flavours in the beverage. This place makes a lot of different beers, many of which I have enjoyed over the last few years. I enjoy that they list a clear bottling date, a clear expiry date and a recommended drinking temperature on each bottle. In 2004, this brewery started in this windmill (Molen is Dutch for Mill) and still operate this location today as a test batch, bottle shop, tasting room and restaurant with the main brewery just down the road. If I ever get out that way, I’ll be sure to stop by. This short video is from their Facebook page, which you can access by click on the logo below. I would love to try a bottle of this now and on its 25th birthday. Where did you find this? West Coast Liquor on Royal Oak had them, had some neat stuff actually (a little less picked over).